Finally, a patio pet door product that actually works as advertised! Based in Tacoma, Washington with sales and marketing located in Bend, Oregon, Pet Door Design, Inc. is devoted to creating pet door solutions that make life better for people and their pets. We have over fifteen years of experience as one of the Northwest’s most innovative vinyl window and door manufacturers. We are committed to your complete satisfaction and have the resources to design and manufacture our products using the very best techniques and materials available. The Pet Door Design Conversion Frame is built from fusion-welded vinyl. It comes complete with thermal pane safety glass and a quality pet door, sized to fit your pet, already installed. No additional fasteners, brackets or clamps are needed. No cutting or drilling! We offer four different pet door opening sizes and custom step-over height or “rise” to insure your pets ease of use. Determining the size and rise your pet needs is simple and fun as detailed in the Pet Door Sizing Guide page on our website. Here is what you will receive depending upon the size you choose. · Frame material: white or beige fusion welded vinyl. · Glass: clear double pane safety glass. Low-e and tint are optional. · Pre-installed pet opening sizes: small, medium or large included. X-Large is optional. · Standard sizing: existing door panel being converted. Maximum frame width: 36”. Maximum frame height: 82”. · Over-sized: existing door panel being converted. Maximum frame width: 48". Maximum frame height: 96". New 60” wide by 82” high conversions now available for 10’ wide 2-panel, 82’ high doors. What Are The Benefits Of The Patio Pet Door Conversion System? · Allow your sliding door to slide, lock and function the same. · Allow your screen to work normally. · Maintain your doors built in efficiency. The system comes with new double pane safety glass. Your weather stripping still lines up and seals properly. · Allow Secondary locks and alarms to work without modification. · If you sell your home or no longer have a pet, the original glass can be re-installed in minutes. · One touch opening, the security cover easily removes when in use. Security cover with deadlock adds security and is weather tight when closed. · National brand pet opening comes in four sizes and features an efficient magnetic closing strip to help prevent drafts. The solid aluminum frame is both durable and attractive. Will The Patio Pet Door System Fit In Any Sliding Patio Door? The patio pet door conversion system will fit most double pane vinyl, wood and aluminum framed doors manufactured in the United States. Our conversion frame comes in three sizes designed to fit doors featuring over-all glass thickness from 5/8th inch to 1 inch, common to most patio doors and windows. Call us or talk to your dealer for details. Wood and fiberglass doors featuring over-all glass thickness between 1/2 inch and 1 inch with replaceable stops also work well. Your installation expert can quickly identify any potential problems prior to ordering. What Do Our Customers Say About Our Patio Pet Door System? Paul, the pet door arrived in perfect condition. The installers put it in yesterday and we used the box it came in to store the original piece of glass. The tint on the glass and the frame match our existing ones perfectly. The pet door looks wonderful and we are so excited for the dogs to come to the new house and try it out. This is one of the most exciting discoveries that we have made in a while. My daughter found you on the Internet and we didn’t even know such a thing was available. Thanks for all your help. Good luck with your business. Anyone with a patio door and a dog definitely needs one of your products. The dogs love it!!!! Very nice quality product as promised. I'd highly recommend your product to other pet owners. Thanks for your assistance with the whole process. It is very much appreciated. BTW, the installers also commented very favorably on your product as well. 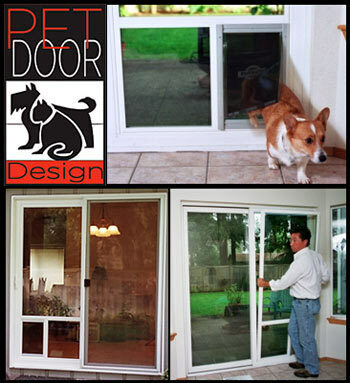 Order Your Patio Pet Door System Today! If you are looking for a custom Patio Pet Door System that works beautifully and won’t block your entry, then you need our system! Our product is the only patio pet door that allows your sliding door to lock, latch, and function normally. Don’t settle for an inadequate pet door system contact us today!